It has often been said that we spend more time at work than at home and recent studies back that up, announcing that 78 percent of people who work 30 to 50 hours a week spend more time with co-workers than with their families. Although many employers want to increase employee engagement, there needs to be more attention placed on co-worker relationships because employees who have quality relationships with their co-workers are more likely to be engaged and happy at work. And happy engaged employees will mean increased productivity, and decreased time off, sickness and mental health issues. Employers can boost employee engagement by creating a culture filled with healthy co-worker relationships. I have outlined below a few key ways employers can encourage employee engagement to create a healthy workplace. Employee recognition is critical in preventing employee turnover and dissatisfaction in the workplace. Make sure you celebrate employee accomplishments, not just on a one-to-one basis, but with the entire company. Make a point to thank the employee in front of the whole department or even the entire company, depending on the size of your company. If the accomplishment has a large monetary impact on the business, then you may consider presenting them with a “high achiever” award or a gift. When employers encourage workplace friendships, they help boost employee morale, and encouraging supportive and trusting relationships help employees stay engaged and maintain a sense of belonging at a company. In addition to setting up social events, which encourage employees to interact on a more personal level, employers can create an office space that encourages conversation. For example, have open office space or provide a space for employees to hang out in their free time (i.e. a small gym or even a lunch room). Years ago, when an employee reached a 25-year anniversary, they were given a watch. Today, as employees do not tend to stay with the same company for a “lifetime”, employers need to invent creative milestone events to remind employees of their value to the company and how much they’re appreciated. Milestone events may include employee anniversaries, birthdays, anniversary of signing on a large account, memorable activities or other employee accomplishments. Quite simple, if employees are engaged, recognized and appreciated they will feel happy, your company will be a healthy workplace and they will keep working hard and remain loyal to the company. 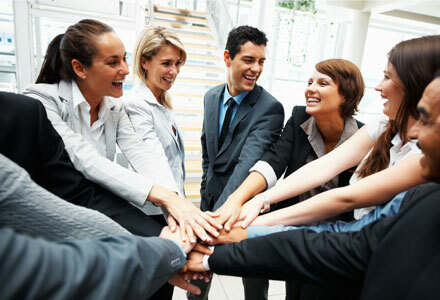 What are some ways your company has created healthy co-worker relationships in the workplace? Categories: Health and Wellness, Health Management, Job Performance, workplace wellness | Tags: co-worker relationships, employee recognition, Health, Morale, Workplace, Workplace wellness | Permalink. Wellness programs are linked to increased productivity, a reduction of long-term health care costs and less absenteeism. In fact, it has been shown that a 28% reduction in sick leave, 26% lower heath costs and 30% lower compensation and disability costs are directly linked to wellness programs in Canada. The facts are undeniable, and the good news is that even if you feel your organization does not have the financial or staffing resources to implement a wellness program, there are many small steps you can take to promote wellness at work that do not include elaborate or costly investments. I have outlined below five ways to help you bring your company closer to wellness. Categories: EAP, Fitness, Health and Wellness, Health Management, Job Performance | Tags: Education, exercise, Productivity, Stress, Workplace wellness | Permalink.